Mouse anti Influenza B Nucleoprotein antibody, clone B017 used for the evaluation of viral nucleoprtien by western blotting. NS1 WT but not dsRNA-binding deficient NS1 protein co-sediments with PKR and vRNP upon density gradient centrifugation. (A) A549 cells were infected with WT virus or mutant virus #4 at an MOI of 1. Cells were lyzed 12 hours p.i. and subjected to centrifugation through a continuous 5 to 50% sucrose gradient. 16 fractions were taken from top to bottom. Fractions 1 to 9 were analyzed by immunoblotting with antibodies specific for PKR and the viral NP and NS1 proteins. Also, RNA was extracted from gradient fractions 1 to 9 and was subjected to dot blot hybridization with probes specific for HA vRNA and NS vRNA, respectively (panels “HA and NS vRNA”). Whole cell lysates were analyzed by immunoblotting with antibodies specific for phospho-PKR, total PKR, viral NP, viral NS1 and tubulin as indicated (right panel,“lysate”). (B) A549 cells were mock treated or infected with WT virus or virus mutant #4 as described in panel A. Lysates were prepared and subjected to immunoprecipitation with anti-PKR (α) or control antibody (ctrl). The precipitated complexes were analyzed by immunoblotting for PKR and NS1 proteins. RNA was isolated from an identical set of PKR immunoprecipitates of cells infected with the mutant virus and subjected to dot blot analysis with an RNA-probe specific for HA vRNA. 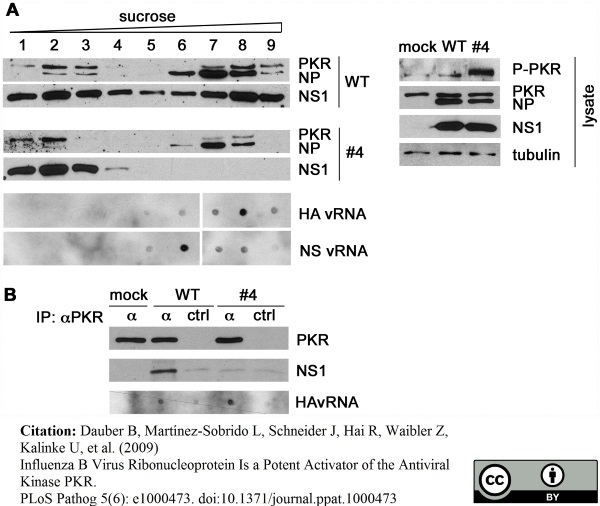 Influenza B Virus Ribonucleoprotein Is a Potent Activator of the Antiviral Kinase PKR. Mouse anti Influenza B Nucleoprotein antibody, clone B017 used for the evaluation of viral nucleoprtien by immunofluorescence and western blotting. 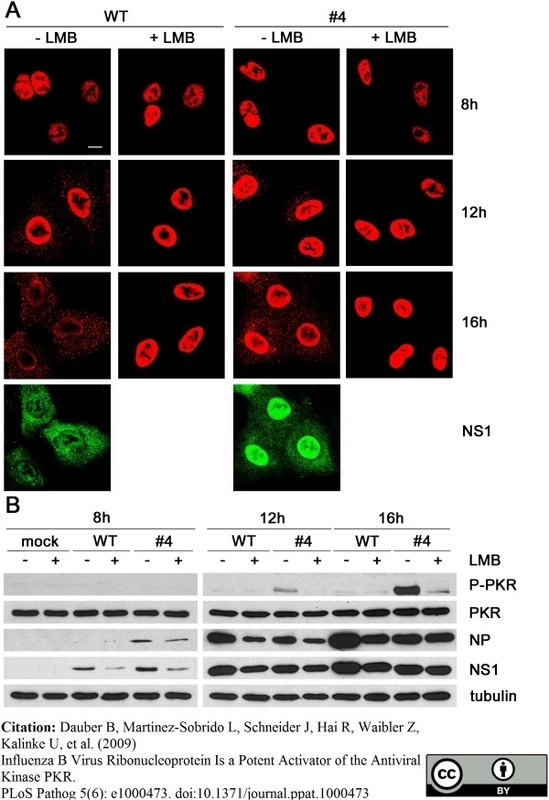 The nuclear egress of vRNPs late in infection leads to PKR activation. (A) A549 cells grown on glass cover slips were infected with WT or mutant virus #4 at an MOI of 1. Cells were mock treated or complemented with LMB starting at 3 hours p.i.. At 8, 12 and 16 hours p.i., cells were fixed and stained for NP (shown in red color), and also for the NS1 protein at the 16 h time-point (shown in green color). Microscopic sample analysis was conducted by confocal laser scanning microscopy. Scale bar, 10 µm. (B) A549 cells grown in culture dishes were infected with WT virus or mutant virus #4 at an MOI of 1. Cells were mock treated or complemented with LMB starting 3 hours p.i. and lyzed 8, 12 and 16 hours p.i.. Whole cell lysates were analyzed by immunoblotting with antibodies specific for phospho-PKR, total PKR, NP, NS1 and tubulin as indicated. From: Dauber B, Martínez-Sobrido L, Schneider J, Hai R, Waibler Z, Kalinke U, et al. (2009) Influenza B Virus Ribonucleoprotein Is a Potent Activator of the Antiviral Kinase PKR. PLoS Pathog 5(6): e1000473. Mouse anti Influenza B Nucleoprotein antibody, clone B017 recognises an epitope within the nucleoprotein of influenza B virus. The influenza viruses, classified as type A, B and C, are members of the Orthomyxoviridae family which differ in their epidemiology and host ranges and lack serological cross-reactivity of their internal components, especially their matrix proteins and nucleoprotein. Influenza B virus is a slow-mutating single stranded RNA virus subject to antigenic drift which, although enough to prevent lasting immunity, prevents influenza B from causing pandemics. Mouse anti Influenza B Nucleoprotein antibody, clone B017 can be used in influenza B IFA typing in conjunction with MCA2717 (clone B114). Spleen cells from immunised BALB/c mice were fused with cells of the P3 Ag8.653 mouse myeloma cell line. Walls, H.H. et al. (1986) Characterization and evaluation of monoclonal antibodies developed for typing influenza A and influenza B viruses. J Clin Microbiol. 23 (2): 240-5. Zhirnov, O.P. et al. (1999) Caspase-dependent N-terminal cleavage of influenza virus nucleocapsid protein in infected cells. J Virol. 73 (12): 10158-63. Ehrhardt, C. et al. (2007) Activation of phosphatidylinositol 3-kinase signaling by the nonstructural NS1 protein is not conserved among type A and B influenza viruses. J Virol. 81 (21): 12097-100. Goujon, C. & Malim, M.H. (2010) Characterization of the alpha interferon-induced postentry block to HIV-1 infection in primary human macrophages and T cells. J Virol. 84 (18): 9254-66. Dauber, B. et al. (2009) Influenza B virus ribonucleoprotein is a potent activator of the antiviral kinase PKR. PLoS Pathog. 5 (6): e1000473.